Gondola rides in Venice: Is a trip with a gondola worthwhile? Prices for a gondola ride and booking on the Internet. In this article you will learn what a gondola ride in Venice costs and how to book such a tour. Is a gondola ride worthwhile? A gondola ride is the romantic classic on a holiday in Venice. On the one hand, a trip with a gondola through the canals of Venice can be an experience you will never forget. But some tourists are disappointed after a tour with the gondola through the canals of Venice. Often the gondoliers are the reason. Some are not very friendly, others even use their mobile phones during half of the trip. But this is not always the case. Only a small part of the gondoliers actually sing the famous song "O sole mio", which actually comes from southern Italy (Campania). However, many gondola drivers speak English well and talk about the city or the top sights along the way. Gondoliers are very different types of characters. Some have a great sense of humour, others complain about politicians in Italy or pollution in Venice. Almost all love their city Venezia. Almost all speak English more or less well. What does a gondola ride cost? Important: A normal gondola (about 10 metres long) usually has room for six people. The journey costs the same amount, regardless of the number of people. Of course gondola ride is really beautiful and romantic, especially for two. Demand: In the season the prices are higher, as well as at certain times of the day. Most people want to take a gondola through Venice in the afternoon or evening, so it is cheaper in the morning. If there are many tourists queuing up at the gondola stop, you often pay 150 euros and more for a journey of 30 minutes. 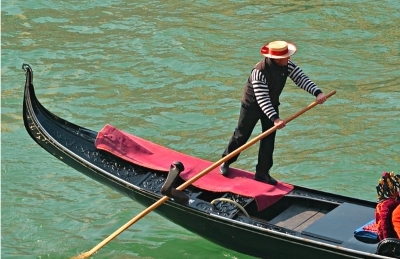 If there is not much going on, with a bit of luck you can also find a gondolier for less than 100 euros. The length of the trip: Most tourists book a gondola in Venice for about 30 minutes. The prices above refer to this travel time. Of course you can rent a gondola longer for a higher price. 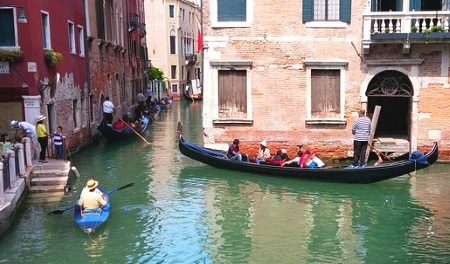 Your negotiating skills: The price of a tour with a gondola through Venice is often negotiable. This, of course, requires sure instinct. The area: In some areas of Venice there are so many gondolas on the way at certain times that they literally accumulate in smaller canals. This applies, for example, to San Marco. In less visited regions of Venice a gondola ride can be much cheaper at certain times. How do I find a gondola in Venice? There are gondolas all over Venice. When there is not much going on, free gondoliers wait there for customers. You can simply go there and discuss the route, the travel time and the price. 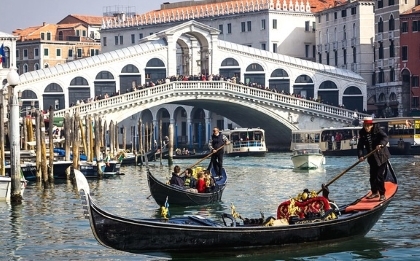 More and more visitors to Venice book a tour with a gondola in advance on the Internet. This is often cheaper. It also has other advantages. You know the price in advance and you have a fixed date and time of departure. Waiting times and lengthy negotiations are therefore eliminated. The duration of the gondola ride is also regulated in advance. Especially during high season it is often not easy to find an affordable gondola in Venice. .Where in Venice should I take the gondola? Venice is big, you can't go through the whole city in half an hour with a slow gondola. Some tourists dream of a gondola tour in Venice on the famous Canal Grande Venice. Others prefer small, quiet narrow canals. Gondola rides are offered almost everywhere in the old town. Around St Mark's Square it can often become so crowded that there is a traffic jam. Sometimes you are stuck in the gondola jam for several minutes. You can try your luck for example in the area around the Hard Rock Cafe near St. Mark's Square. Today the gondolas of Venice are quite uniform. There are relatively precise regulations on what a gondola should look like. All gondolas are black. The Venetian gondolas have a length of about 10 meters and are about 1.5 meters wide. The gondolas used as ferries across the Canal Grande are slightly wider. The boats are mainly made of wood. Most gondola builders use 7 or 8 different woods. The hull is mainly made of oak and pine. At the front of the gondola is a large, eye-catching metal fitting weighing over 20 kilos. This metal at the bow is the counterweight of the gondolier (boatman) standing behind. But it is also a nice decoration of the gondola. The fittings are the same on all boats. The 6 points stand for the 6 districts of Venice. Gondola builders were an important craft in Venice. Today there are only about 4 companies that produce the traditional ships. Some tourists visit a gondola shipyard. A well-known boatyard is on the Rio di San Trovaso in the south of the old town. Price of a gondola: Even today, the construction of the gondola is still largely manual work. For a single craftsman, building a boat takes several months. A new gondola usually costs between 25,000 and 30,000 euros. Also the boats have to return to the boatyard from time to time for expensive repairs. One reason why a gondola ride in Venice is not exactly inexpensive. In the past there were many more gondola yards and gondolas. The first gondolas were built about 1000 years ago. There used to be different types. Fast, smaller boats and rather slow gondolas for transporting heavy goods. All persons and goods used to be transported on gondolas. Most gondoliers (boatmen) are very proud of their old profession. Many have a long family tradition. A gondolier told us that his family has been gondola gondoliers for at least 8 generations without interruption. Controling a gondola is not easy. The training usually takes years. The gondolier controls the ship with only one rudder (italian: remo). In addition, the captain of the gondola skilfully pushes with a foot away from the shore, walls and other boats. There is also a fork (Forcula) fur the rudder. Both the rudder and the fork are made of wood, just like the boat. A big challenge are the many narrow and low bridges in Venice. 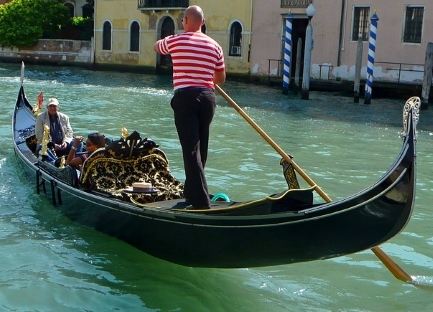 The increasing traffic on the small canals does not make the work of a gondolier any easier. Female gondoliers: After a long discussion there have been women as gondola drivers in Venice for some years now. They had to fight for their rights in court. The few women in this profession are called Gondoliera in Venice. The gondola drivers of Venice are very different in character. Some like to talk loudly and also like to sing. Other gondolieri are rather quiet types, but like to tell stories and know a lot about the sights. A gondola ride in Venice is not only romantic, but also interesting. If you know a lot about the history and technology of these small ships, it's even more exciting.